Though some sly and adventurous souls managed to accomplish the feat during the carefree days before 9/11, our colleague Christine Gasparac recently got an official tour that took her to one of San Francisco's most spectacular and exclusive locations: the tippy-top of the Golden Gate Bridge. First, they transport you in a little jitney along the bridge's pedestrian walkway to the Tower. You duck into a little secret door that leads to an elevator that was designed for the bridge tower in 1937. It's a tiny, rickety old caged elevator that is hand-operated, holds no more than 3 (relatively thin) people and moves so slowly that it takes almost 5 minutes to reach the top (the top of the tower is 759 feet above the water). 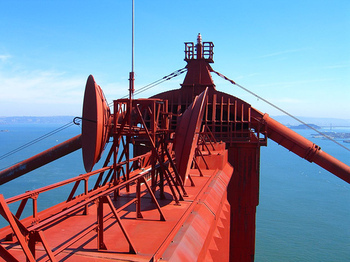 Then you climb about 20 feet to a submarine-style iron-rung ladder and out a hatch that pops open onto the top of the highest crossbar of the tower. When we were up there, there was almost no wind. And you're so high up that you can't even hear the traffic below. We seethed with jealousy when Christine first told us of her planned visit, but we pleaded with her to at least bring a camera, and she duly complied. Providentially, the weather was spectacular, and her photos are amazing. See you at the summit.